Arm, shoulder, and chest strength are crucial to maintaining independence and warding off injury. When your upper-body strength dwindles, you risk more than the loss of power to open a car door or lift a bag of groceries. "It's not just a strength problem; it may also be a length problem. Shorter muscles reduce your range of motion. And if you do any reaching activities without adequate range of motion or muscle strength, like hanging curtains or putting dishes in an upper cabinet, you can get a small tear in a muscle or rotator cuff or tendinitis in the shoulder," explains Clare Safran-Norton, clinical supervisor of rehabilitation services at Harvard-affiliated Brigham and Women's Hospital. A number of major muscles and muscle groups enable us to use our arms and shoulders throughout the day. The deltoid muscle moves your entire arm at the shoulder joint and helps you wave your arm overhead. The biceps muscle on the top of your upper arm helps bend your arm at the elbow joint, making it possible to raise a glass to drink. The triceps muscle on the underside of your upper arm straightens your arm at the elbow joint, so you can push a window up. The pectoralis muscles in the chest allow you to move your arms up, down, in, and out, so you can push something away from you or lift something up. The trapezius muscle in your upper back moves your shoulder and shoulder blade, so you can shrug. The rhomboid muscles, under the trapezius, move your shoulder blade back and forth (think of starting a lawnmower). The latissimus dorsi muscle at the side of your mid-to-lower back pulls your arm down, so you can pull a window down. Also crucial to upper-body strength is the rotator cuff in each shoulder: the group of tendons and muscles that helps you raise and rotate your arm. At around age 35, we start losing muscle mass at a rate of 1% to 2% per year. After age 60, muscle loss accelerates to 3% per year. This deterioration is called sarcopenia. "Your muscle cells shrink, and you also lose some of the speed at which the motor neurons fire messages from the brain to the muscle. So you become slower, and you lose muscle mass, bulk, and power," explains Safran-Norton. If you're less active when you're older — maybe because of energy or arthritis pain — you face a "use it or lose it" problem: that sedentary lifestyle and disuse of the muscles can also cause them to shrink or tighten. Starting position: Stand tall with your feet about shoulder-width apart, your chest lifted, and shoulders back and down. 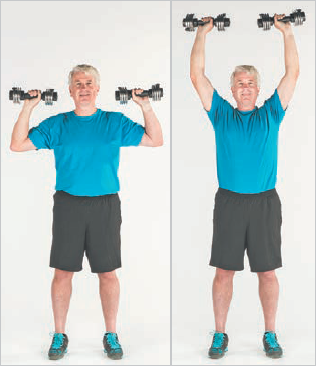 Hold a dumbbell in each hand at shoulder height with your palms facing forward and elbows pointing out to the sides. Movement: Slowly raise the weights straight up until your arms are fully extended. Hold. Slowly lower the dumbbells back to the starting position. Tips and techniques: Keep your abs tight. Keep your spine neutral and your shoulders down and back Don't pull your elbows back in starting position. Starting position: Place the band under both feet. Grasp each end of the band with your palms up. Then flip your hands over so your palms are facing you and the ends of the band hang inside your hands toward each other. Stand tall with your arms extending down in front of you. 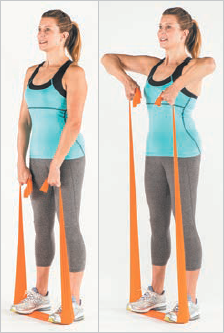 Movement: Bend your elbows out to the sides and pull the band to chest height. Hold. Slowly extend your arms and return to the starting position, resisting the pull of the band. Tips and techniques: Don't arch your back, and keep your abs tight. Keep your shoulders down and back, away from your ears. Keep your wrists straight, in line with your arms. The great news is that you can improve muscle size and strength. Safran-Norton recommends working with a physical therapist to get back on track. The therapist can evaluate the strength and length of your muscles and the range of motion of your joints, and then design a program to fit your particular needs. A program typically involves gentle stretching to keep muscles supple, plus strengthening exercises like triceps curls, with low amounts of weight (just a few pounds) and a high number of repetitions. That's because you don't need to bulk up; you need to condition your muscles and increase their stability and endurance. 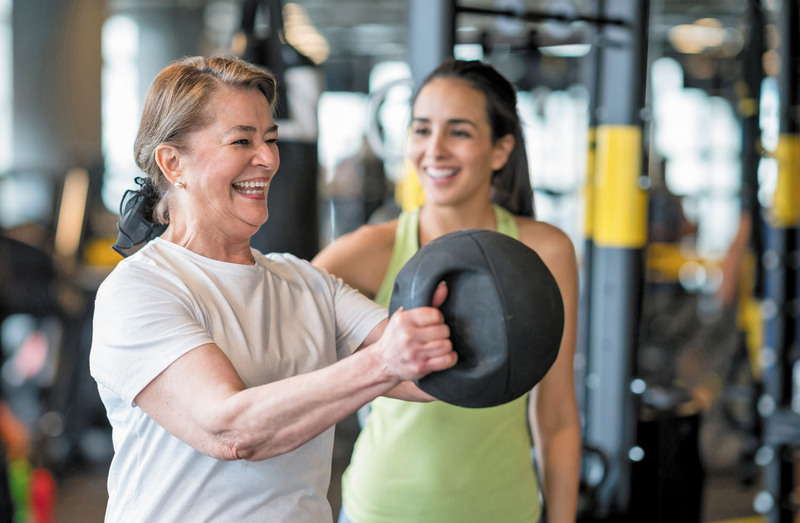 Just remember that once physical therapy is over, it will be up to you to keep your muscles strong, either by going to a gym or maintaining your own home workout two or three times per week. We've given you a few easy upper-body boosters below. For more workout ideas, check out the Harvard Special Health Report Strength and Power Training for Older Adults (www.health.harvard.edu/spt).